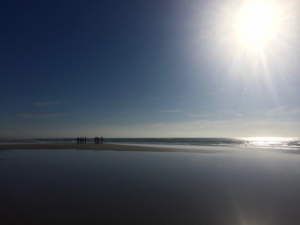 The first day of the field trip had us venture to Praia do Meco, a small region of the Portugal coast where we could measure water flow and the gradient of a small stream. Later in the day, we arrived at Costa da Caprica, a sandy coastline to the south of the river Tagus’ mouth. Due to reduced sediment from the Tagus, this shoreline has retreated considerably in the last 50 years, with longshore drift regimes heavily eroding the coast. 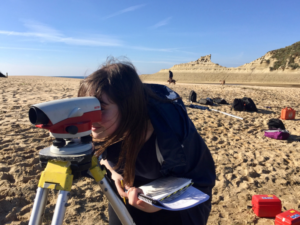 Using handheld GPS receivers we could measure the elevation of the sand at different points in order to evaluate the extent to which seawalls and groynes have been successful in mitigating coastal erosion. Once back at our hotel we would eat dinner and then complete further tasks in relation to the data acquired that day. 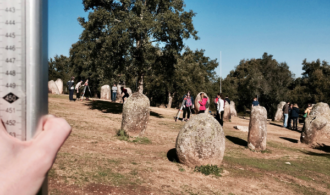 My favourite day of the whole field trip had us visiting an 8000-year-old megalithic standing stone structure near the city of Evora. 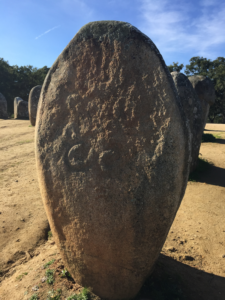 After a brief history of the site from a local tour guide, we began measuring the gradient of the slope on which these 95 standing stones reside. Due to constant footfall here, there is little vegetation to protect the soils around these stones, as such, soil erosion is a constant threat to the stability of these structures. Following these measurements, we began taking hundreds of pictures of the rocks using a fairly new technique known as photogrammetry (creating 3D objects out of images). The 3D models created using this technique allowed us to see old rock carvings, preserving them from damage albeit digitally. This day was heavily focused on the land around the river Tagus. We began by measuring flora and fauna in a local marshland before venturing inland to gravel pits that have exposed old quaternary river terraces. 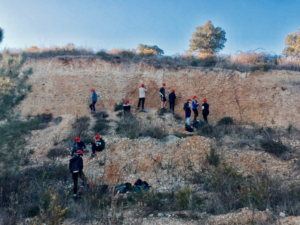 By measuring the change in the angle and direction of rocks embedded in the wall of the gravel pits we could reconstruct the evolution of the river Tagus and the direction of previous river flows. Although measuring 100 rocks could be enough to drive anyone insane, the data we collected successfully showed the historic river flow direction! This was one of the most demanding days of the field trip and involved sediment coring at the Albufeira Lagoon near Praia do Meco. Sediment coring comprises of pushing metal borers into the soil and pulling them out in order to reveal the sediment layers beneath. These sediment layers serve as a record of how the environment has changed over time. Unfortunately, my group kept hitting solid rock at 2 meters, but other groups had cores 5 meters below the surface, revealing old fossils from the ancient coastal lagoon system. The final day of the field trip involved revisiting our choice of location in order to attain data that would form part of our assessed project. 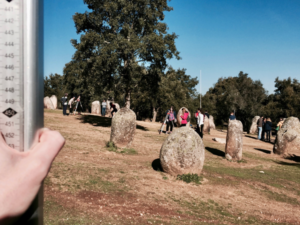 My group opted for a photogrammetry project at the stone Cromlech to further develop our 3D photography skills. By the end of the day, we had taken over 1500 images and exhausted all of our phone storage. Once the images were imported into the 3D software the rock carvings were revealed with greater clarity, allowing us to measure their relief and erosion rates. This may have implications regarding their conservation in future, perhaps demanding exclusion zones or shelter from the rain. 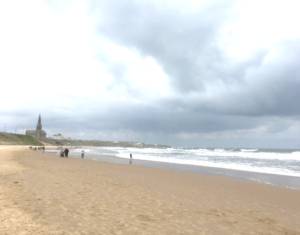 The Department of Geography at Durham is one of the leading centres of geographical research and education in the world and have been ranked in the top 10 for six consecutive years in the QS World University Rankings by Subject (2018). Learn more about the Department of Geography and what they do by visiting their web pages here. Hi, I’m Daniel and I am a first year BSc Geography Undergraduate at Trevelyan College. Outside of my studies, I enjoy cheerleading for my college and being a member of our social committee. 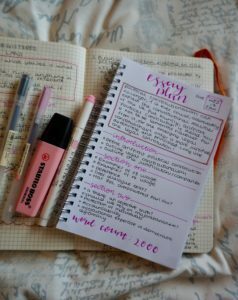 My other passions include design, travel, and singing!